Pølser is a type of boiled sausage very common in Denmark. 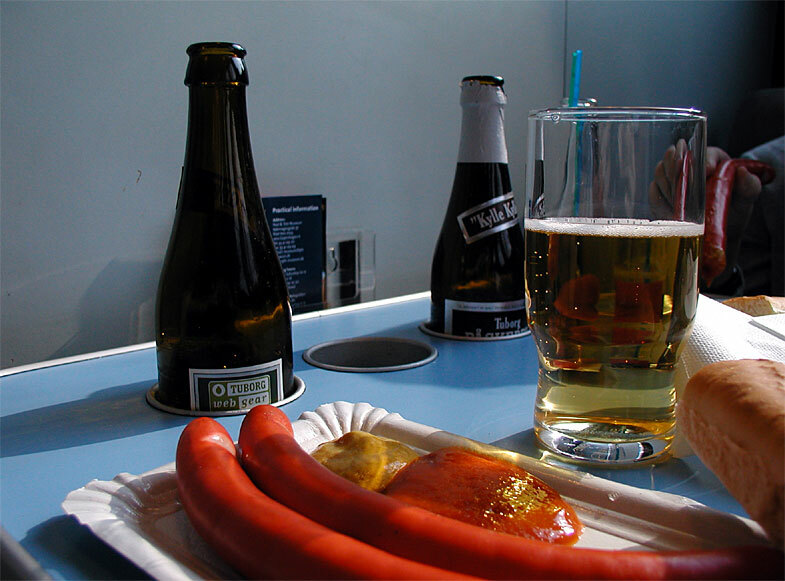 Since hot dog stands are ubiquitous in Denmark some people regard pølser as one of the national dishes. Their most noticeable aspect (never the fried ones) is that the skin often contains a traditional red dye making it bright red. Left: Red pølser and beer. Pølser are commonly served with remoulade, mustard or ketchup, dried onions and pickled cucumber. Legend has it was once ordered that day-old sausages be dyed as a means of warning. Other sources claim a butcher in Lyon was first to invent red-dyed sausages. Scandinavian sausages are usually made of 60-75 % very finely ground pork, very sparsely spiced with pepper, nutmeg, allspice or similar sweet spices (ground mustard seed, onion and sugar may also be added). Water, lard, rind, potato flour and soy or milk protein are often added as fillers. Virtually all sausages will be industrially precooked and either fried or warmed in hot water by the consumer or at the hot dog stand.